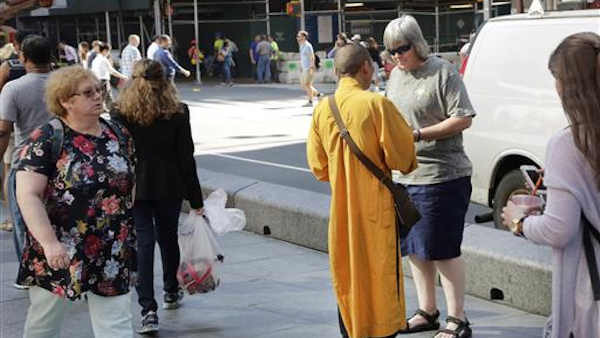 NEW YORK -- New York City Buddhist leaders are sounding the alarm to tourists: Beware the "fake monks." Men in orange robes claiming to be Buddhist monks are approaching visitors to some of the city's most popular attractions, handing them shiny medallions and offering greetings of peace. They then hit them up for donations to help them build a temple in Thailand, and are persistent if their demands are refused. "The problem seems to be increasing," said the Rev. TK Nakagaki, president of the Buddhist Council of New York, a group that represents nearly two dozen Buddhist temples. "They are very aggressive and hostile if you don't give them money." His group has taken to the streets and social media to warn people that the men appear to have no affiliation to any Buddhist temple. "Please be aware," read one Facebook post, "this is a scam." Along the popular High Line elevated park, one of the robed men handed a couple a shiny, gold-colored medallion and a plastic beaded bracelet. He then showed them photos of a planned temple and barked, "Ten dollars! Twenty dollars!" When they wouldn't give up cash, he snatched the trinkets back. Other brightly robed men have been spotted pulling the same routine, albeit more successfully, in Times Square, not far from where costumed characters such as Elmo, Minnie Mouse and the Naked Cowboy take pictures with tourists for tips. Some of the monks were later seen handing wads of cash to another man waiting nearby. The Associated Press tried to ask more than half-dozen of the men about their background and the temple they said the donations were being used to support. Each claimed to be a Buddhist monk collecting money for a temple in Thailand, but none could give its name or say where exactly it is located. All the men refused to give their names and ran off when pressed for answers. The men first started appearing at the High Line, a New York City public park that's maintained by a private nonprofit group, about three years ago, said Robert Hammond, executive director of Friends of the High Line. But it "became excessive" in the past year, he said, with up to a dozen of the men accosting tourists at once and sometimes grabbing them to demand cash. Panhandling on city streets isn't illegal in New York, as long as the person isn't acting aggressively. But the city's parks department has a rule that says it is unlawful to solicit money without a permit from the parks commissioner. When asked about the men, New York City Parks Commissioner Mitchell Silver initially said, "I have no idea what you're talking about." He later said that if the men aren't abiding by the law, "the parks enforcement patrol will take care of it." But parks department spokeswoman Crystal Howard said parks enforcement officers hadn't issued any summonses and the men's actions were "aggressive panhandling," a violation of state law that would be enforced by police. New York City police say that in the rare cases when someone has called 911 against the men, they were usually gone by the time officers arrived. A few days after the AP inquired about the men on the High Line, several signs were posted there with photos of them, warning visitors not to give money to panhandlers. Similarly robed men have been spotted in San Francisco, asking tourists to sign their "peace petition" before demanding cash. In China, authorities said the problem of "fake" monks begging in the streets prompted them to create an online registry of all actual Buddhist and Taoist sites. In Times Square, the warnings came too late for tourist Rob Cardillo, of Pennsylvania. He gave a robed man $10 to help out with his temple, without ever asking anything about the temple or what the money would be used for. "He might be fake, but it's the thought and I feel it," Cardillo said as he gripped the gold medallion.